← Sharapova Loses Early (Again) at Indian Wells. Indian Wells Sunday Thoughts – Is Nadal More Popular than Fed? It’s been a long day down at Indian Wells. This is my first time attending early round action here and the vibe reminds me of the U.S. Open except things are little more laid back and little closer together. This is especially true of the practice courts which are right across from the main stadium and draw almost bigger crowds than the main matches. Sure, it’s fun to see Rafael Nadal, Kim Clijsters and Roger Federer practice. For about a minute. Why people want to waste their paid ticket staring at someone hit drills is beyond me? Speaking of Nadal, his arrival at his doubles match today was a bit of a scene. Leander Paes and Lukas Dlouhy arrived early and had to wait fifteen minutes for Nadal to show up. After the crowd got into the wave, Nadal finally arrived in a vehicle that looked something like the “Popemobile”. As he hopped out, already mobbed by fans, he strode onto court to a thunderous applause. Federer may be the sport’s ambassador, but certainly Nadal is the sport’s “rock star”. Watching Robin Soderling live for the first time was interesting. 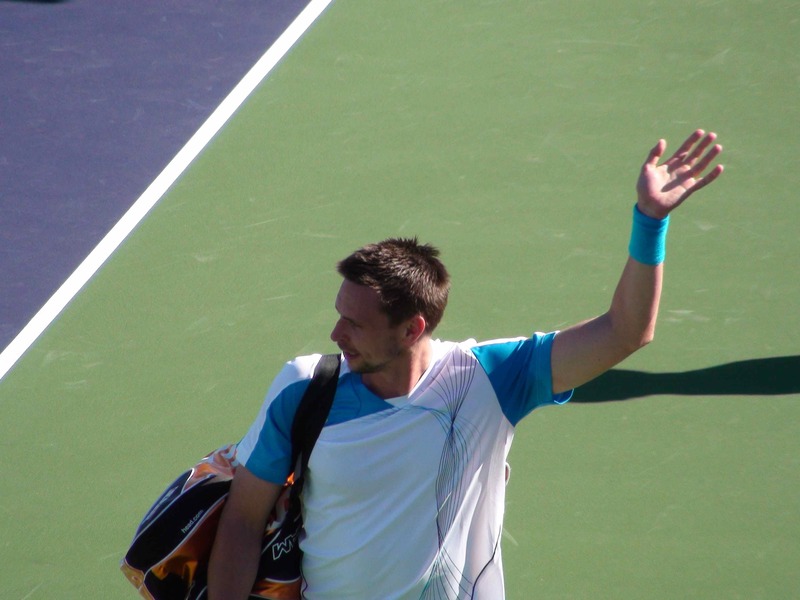 Soderling put in a workman-like performance to take out Evgeny Korolev 6-2, 6-4. The Swede definitely uses his racquet almost like a frying pan and hit every shot as flat and as hard as he can. He’s not the most graceful player to watch, but I wouldn’t count him out in this event. Andy Murray after taking out Andreas Seppi 6-4, 6-4 decided he needed more of a workout. So about thirty minutes later, Murray strode out to the practice courts with his training “buds” and proceeded to play in a weird football drill where they would kick the ball and then try to knock it over the net. With their heads. I’m not sure what Murray gets out of it, but it was strange enough to have Ivan Ljubicic, who was practicing the next court over, to stop by and see if he might get something out of it. Probably not. 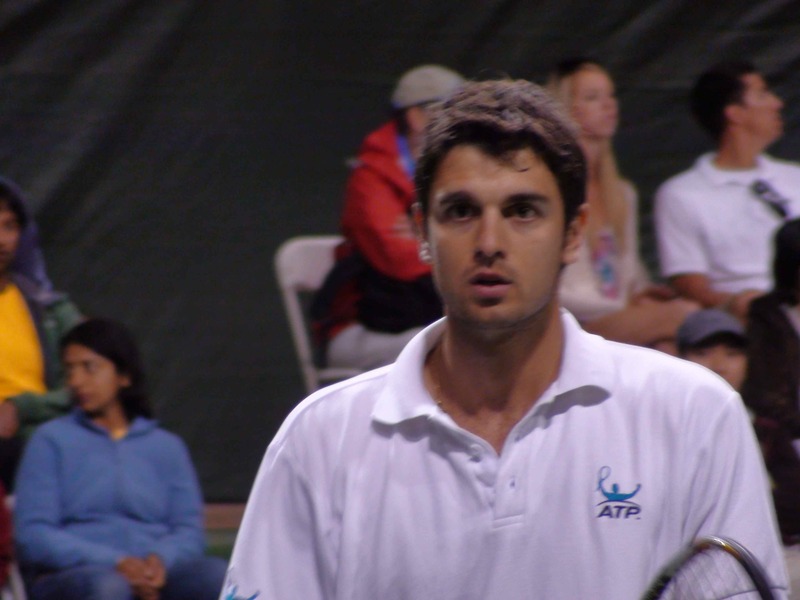 Finally it was nice to see Mario Ancic back on the courts. He and his doubles partner Mardy Fish lost to the entertaining Spanish duo of Fernando Verdasco and Feliciano Lopez. Ancic, who had been sidelined with mono for what seems forever, moved well and still had that great serve which got him to the quarters of Wimbledon a few years ago. Ancic, who is still in the main draw, gets to take on Rafael Nadal tomorrow. Whether Ancic has got the stuff to take out the “rock star” is highly unlikely, but the fact he’s back on a court (and not as a lawyer) may be the reward itself. – Marcos Baghdatis is taller than he looks. I walked past him and he was almost eye to eye with me, and I’m 6’4″. – Mardy Fish is rail thin now. – Feliciano Lopez is super buff and a great volleyer. Why doesn’t he do better at Wimbledon? For more photos, click on the link to my Facebook page. Rafa rocks!! He’s definitely the game’s rockstar…without Rafa, tennis is montonous, predictable and BORING!! Federer is a great player*, sure, but Rafa is definitely my pick over the two. *I sure hope no Fedfan leaves a comment regarding the no of GS titles he’s won. We already know how many he has! Love to see Ancic back, going to be an interesting match between him and Nadal. We don’t have to count the No. of GS Fed won or will win, just count on the number of times/years Fed won the Fan Favorite award… Take that! Nadal doesn’t even have one of them,even when he ended 2008 at No. 1. Case closed…until somebody opens it.